I’ve been about more than just crafting mad conversions…but not painting, because let’s not be crazy here! 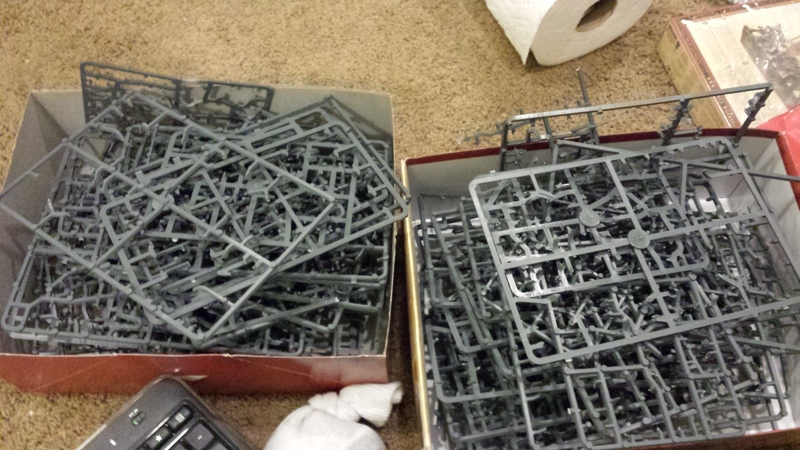 I’ve also been going through allll them sprues, clipping things out, putting them in tiny plastic cases. My wife actually turned to me at some point during this multi-day process and said “This is the best Christmas gift you could have given me.” My lady, she loves organization. I legitimately found things I’d forgotten I had over the course of the process. I bought a box of Tomb Guard at some point! Presumably I picked these up for conversion into Bestigors, and may still go that route. I had so, so many Tyranid bits–mostly a testament to how much each one of those boxes packs in, because I believe I’ve only bought a single box of Termagants and a box of Gargoyles. I was gifted a bunch of Tyranid Warrior miscellania, so I’m curious how I can put that to use…most likely in some sort of chariot/vehicle conversion. I’ve got a box of Gors I’ve done nothing with, so I didn’t delve into that. I already have more assembled–albeit primed at best–Gors I don’t put on the board, so I arguably don’t need another 10 and will probably put most of them into Bestigor service or build characters/unit filler. I have an entire Soul Grinder, planned to join the Brothers. At this point I may just put her on a base and use her in Fantasy, though I could arguably throw all three on bases if I wanted to go that route. I’ve got some more spare Grinder and other parts, just about enough that, if I chose, I could build a Brass Scorpion of Khorne. I’d need to research the dimensions between lesser and greater and so forth, but I’ve also got a Defiler I have no plans to use in current form (and would need to strip, at the very least), so I could probably do this with the extras off of the Grinder after building her. I don’t particularly want a super-heavy, but as we slide into 20GRIFTeen I’m considering going real, real dark on the competitive end of wargaming. The community I worked so hard to build and sustain at the local game store has outright been told “You don’t exist anymore, and we’re melding you with the far less vigorous and active community at the other store, and you no longer have an actual voice in things.” That makes me angry, and sad, and there’s been some amount of bishy gazing into the distance while clutching the remnants of an old flag. But with a new year I’ve considered just dipping dark–because my wife still wants to be able to go to the store, where we have many friends, so I can’t just punch out entirely–and nurturing some ridiculously competitive army list. I’m talking dark, like Tau gunline with Eldar Waveserpent support. Every list I play starts at the aesthetic level (as I think wargaming should) but that aesthetic appreciation has thus far coincided perfectly with the lower-power–if not outright terrible–forces of every system I play. Part of that is my apparent–unintentional, but demonstrated time and again–preference for melee armies. That, in turn, probably stems from my hatred of archers and ranged characters due to getting extremely uncomfortable when asked to manage finite resources like arrows and bullets. Your fists never leave you! I consider running any super heavy dark along these lines, until such a time as they give me a Chaos Imperial Knight, at which point my wife will buy me one. All the big models that’ve dropped recently have elicited a “Don’t you want this?” from her, and I always feel a certain amount of guild that I never do for composition reasons. Plus, I’ve yet to fully paint any of my Rhinos, let alone my Landraider or Heldrake(s! ), so buying those things feels like a massive project. But the moment I can run one in-fluff, I’ll get dirty on at least a singleton. So many skeletons. Originally the plan had been to use most of my skellies as Ungors, but then summoning came out and I turned them into proper Tomb Kings Skeleton Archers. So I have a ton of limbs and weapons, plus the charioteers who were displaced by my kitbashed Ungors/Gors (the Gors are skeletal) on my Tuskgor/Razorgor chariots. Daemon and Chaos Warrior bits and bobs, because of course. I’ve been saying bits and bobs a lot. I blame Sophie. Ogre bits, which my wife and I spent a chunk of tonight combining with all of her Ogre bits. Partially this creates a nice melding of our collections (which I spent the entire process of going “You’re sure you’re okay with walking over here to get those bases? You won’t feel marginalized?” Dudes take note! ), but it also makes it easier for me to do a thing I really, really want to do. That thing is to create an Ogre Firebelly for her, using only Gnoblar parts (and perhaps some Savage Orc bits). It’s going to be great. Little bodies will be on fire and such. We also need to build her a Tyrant, but I’m holding off on that primarily so that she will have to actually engage with the list-building element of the army in order to put it together properly. Firebelly’s easy, though, and I think it’ll be cool! More stuff, I’m sure. So many boxes. Posted in Warhammer.Tagged Warhammer, Warhammer 40k, Warhammer Fantasy. Previous Post Where Do Beastbabies Come From?